It’s December 2016. I am in London. I am moving here, I have to find a flat very quickly, and actually it is a real struggle, waste of vital energies, I am exhausted. Even if I am running up and down around Hackney I pop into Mayfair quite late, at 5.30pm. Hauser&Wirth closes at 6.00, I’m in a terrible hurry. At the moment I am frightened to death to write this paragraph, I will go gentle in that good night. - Will go short here. 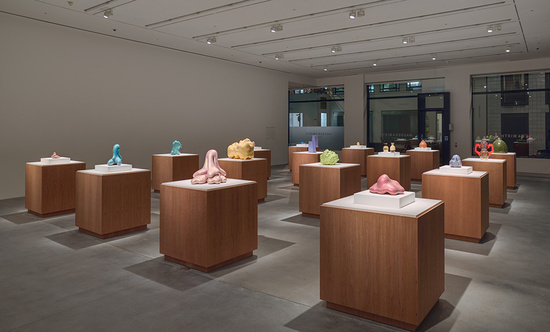 A Survey of Sculptures and Drawings, 1959 – 2006 by Ken Price is a retrospective, a historical, punctual analysis of the work of the American artist. It would sound obvious and tediously insolent to state any word on Price’s work, I will not do it. The space is empty; the gallery staff is packing to leave after a workday. I’m here, it is magical, seriously. I don’t want to leave. I can see how all the artists involved in plastic creation might have learned so much just seeing a picture of any of Price’s works. I can see music, I can hear William S. Burroughs. I am going too mystical, but the sexual allure is real. I think Hauser&Wirth is the first and only commercial gallery to have an in-house curator. Actually, Paul Schimmel is also Partner and Vice-President. At the moment, I am a bit confused concerning the structural differences between this gallery and any middle-sized institution in terms of quality of the program. If I would have the chance to have a second life, I would definitely be Iwan Wirth.